Stadium comes first, and then comes the team. Built in 1910, Vitality Stadium has turned into a legendary battlefield hosting AFC Bournemouth. The stadium depicts the club’s glorious history and is the home of 11,329 of its dedicated supporters. Dean Court is the ground’s original name. When the stadium was built in 1910, it was just a small single stand. In the 1930s it was expanded and the new stands and terraces were built. However, in 2001, it was completely demolished and the new football pitch was constructed. In 2005, AFC Bournemouth had to sell out the stadium because of financial woes. The future of the club was put on the spot in 2008 because of a £4 million debt. What’s worse, the team had to face a 10 point deduction which nearly caused its relegation from the EFL League Two into a non-league division. Luckily for the Cherries, this didn’t happen. Soon enough, the Vitality Stadium and the club’s most dedicated fans witnessed the heroic march of Bournemouth to the Premier League. Ted MacDougall Colmar Stand – was installed in 2013 at the south shortside of the Vitality Stadium. The club has recently tried to buy the Vitality Stadium back with the thought in mind to expand its capacity to 18,000. However, all of their attempts were vain. The management of AFC Bournemouth currently discuss the plan of the new stadium’s construction. If you are looking for the easiest way to buy tickets for the home match of AFC Bournemouth, look no more. StubHub is a wonderful timesaving solution which can be very handy whenever you want to buy football match tickets at a reasonable price. The intuitive interface, advanced navigation, and other helpful features will help you to get the tickets in the most convenient way. At Stubhub, they also have a global delivery service. Ticket office located in the Club Superstore on the corner of the Main Stand and North Stand of the Vitality Stadium. As a rule, the clubs of the Premier League categorise the matches. They sell the tickets for the matches against top clubs at a higher rate compared with the regular matches. AFC Bournemouth don’t have such practice. The ticket prices only depend on the seat’s location at the stadium. The prices currently range from £32 to £50. The Bournemouth area is enjoyed by thousands of tourists during the hot days because of the sand and the sea. In fact, football trips usually occur in the off-season. No matter when you want to visit this city, Booking.com is a perfect solution. It will help you to quickly find the best hotel deals in Bournemouth. Carrington House Hotel – if you are looking for great accommodations with a restaurant, indoor swimming pool, table tennis, and free parking, you may like this option. You can rent a room for £64 per night there. The distance from this hotel to the Vitality Stadium is 1.5 miles. The Ravensbourne Hotel – is a 20-minute walk away from the football ground in Bournemouth. Spend a quiet night in a comfy bed, enjoy a wonderful breakfast and pay only £38 per night. Plenty of shops, cafes, and the beach are located nearby. Elstead Hotel – can be found about 2 miles away from the stadium of the Red and Black Army. The guests may enjoy excellent facilities, a comfortable swimming pool, and even a leisure centre. The distance to the beach is also convenient for a short walk. They usually charge £52 per night. Crossroads Hotel – is a fantastic property located only 2 miles from the Vitality Stadium and very close to the beach. Nicely furnished cosy room costs £65 per night. The area around this hotel is absolutely lovely. Urban Beach Hotel –this boutique hotel is a short walk away from the beach and a 25 mins’ walk from the stadium. Relaxed vibes of its neighbourhood and wonderful facilities are making it a lucky find. The price is £105 per night. The Orchid Hotel – is another fabulous place to stay in Bournemouth for £97. It’s a peaceful area to stay in. This beachfront hotel boasts of superb facilities, a large garden, and excellent service. The Green House – is a unique eco-friendly hotel featuring hand-made furniture, free natural toiletries, and the organic food at a lovely restaurant. If you choose this hotel you’ll definitely have an incredible experience during your stay in Bournemouth. The double room’s price is £129 per night. Bournemouth offers plenty of affordable and cosy transportation options. Furthermore, the ground of the Cherries is located in the north-east of Bournemouth – about 2.5 miles from the most popular areas such as Bournemouth Pier and the Square. By Train – the stadium of the Cherries is within walking distance of both Pokesdown (20 mins) and Bournemouth (30 mins) train stations, which is extremely convenient. By Bus – the bus lines 2, 33, X3, and the Unibus U3 serve the area of the Vitality Stadium. By Car – the stadium’s address is Dean Court, Kings Park, Bournemouth BH7 7AF. It will be helpful if you are arriving at Bournemouth on a matchday by car. However, you should be aware of the traffic jams. 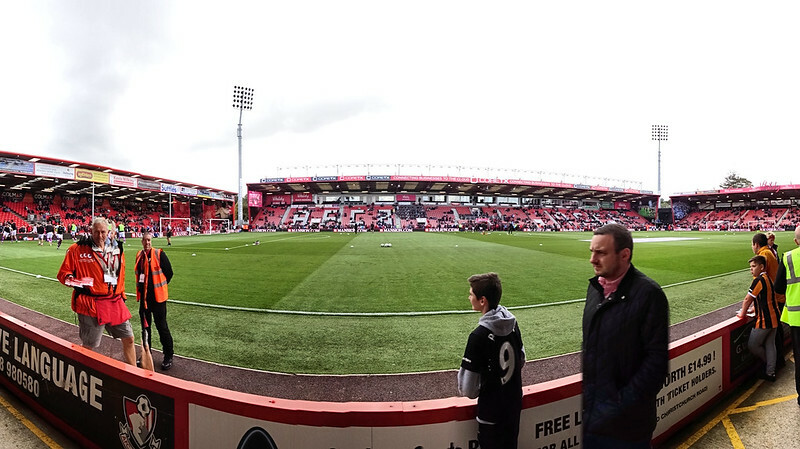 By Plane – the distance from Bournemouth Airport to the Vitality Stadium is only 4.5 miles. Take 737 Jetbus at the airport, take off at Winton Banks and then take the Unibus U3 which will bring you to the ground of the Red and Black Army. The second closest airport to the stadium is Southampton airport (31 miles). South Western Railway will bring you from this airport to Pokesdown train station in less than an hour. From there you can walk to the stadium or take the bus line 2. There is no car parking at the football ground of the Cherries. However, there is always a solution. The approximate matchday paid parking price near the sports venue in Bournemouth is £1-4. Bournemouth’ restaurants and cafes won’t disappoint you. In fact, there are a lot of options ranging from cheap eats to luxurious waterfront restaurants and from traditional English to Asian, Greek, and even Hungarian cuisine. I hope my hints will help you to find the right place to eat out near the Vitality Stadium. English Rose Café – is a very cheap and fine place to eat real British food in Bournemouth. This hidden gem is located only 1 mile from the football ground. They serve pretty much everything including vegan food, traditional egg breakfasts, pork sausages, chips, tea, and so much more. Brewhouse & Kitchen Bournemouth – is an extraordinary British pub with incredible interior and super friendly atmosphere. It features a large choice of craft beers, tasty snacks, roasted veggies and pork. It’s situated near Bournemouth Pier, which is 3 miles from the stadium. Renoufs Cheese and Wine Bar – is a delightful bar located within walking distance from the Vitality Stadium. It’s simply impossible not to fall in love with this place serving over 200 different quality wines, tons of cheese, bread, fruit, and awesome cheesecakes. Moose Kitchen – is probably the best restaurant in the city serving freshly made North American food. You’ll be delighted by the flavours of their meals from the classic Canadian breakfasts to the Mexican tacos. It’s 30 mins’ walk from the ground. Paprika Restaurant – is less than a 20-minute walk from the Cherries’ stadium. If you’ve never tried the delicious Hungarian and Eastern European meals, this restaurant is the best place to give it a try! They have very big portions and fine wines. Restaurant Roots – is a premium class venue which is just a ten-minute drive away from the Vitality Stadium. It’s a truly divine place located close to the sea and its only drawback is the price. Anyway, I would recommend it to anyone visiting Bournemouth. This small stadium is situated in a quiet residential neighbourhood. We all have to admit there is not much to see at the stadium and nearby area apart from the football battles and AFC Bournemouth Superstore. At the moment, the Cherries don’t run stadium tours at the Vitality Stadium. Quite probably, they will soon start constructing a new modern football venue in Bournemouth. Hopefully, their new stadium is going to be available for our detailed exploration. It’s actually unexpected to see a huge modern shop at the smallest Premier League stadium but here it is. AFC Bournemouth Superstore is a real gem for every supporter of the Red and Black Army. It’s a wonderful place to shop and to kill time while waiting for the kickoff. Also, keep in mind that their bargains at the end of season clearance are simply fantastic. The club’s online store can be found here. Crowds of tourists flock to the Bournemouth area in summer but the town is a pleasant place to be at on whatever the weather. It can become a real surprise for the fans coming to enjoy the football spectacle that Bournemouth is such a beautiful and cosy place. You’ll love its accurate streets and greenery, wildlife and the amazing sea views which are magnificent 365 days a year. The majority of tourists love to start exploring new spots on the map by taking the cosy bus tours. If your trip to Bournemouth takes place from April to September, there is a great opportunity to discover the most stunning natural gems of Poole Bay and the Sandbanks Peninsula. The open top double decker hop on hop off bus tours won’t leave you indifferent. The fantastic boat cruises are also available and you can even get a combo bus and boat ticket to save the money for snacks. Check out their schedules and up-to-date prices here. Bournemouth Gardens – the zone between the High Street and the seafront area in Bournemouth is such a lovely space where you can find true relaxation. Among the things to check out, there are the floral and art exhibitions, mini golf course, coy pond, waterfalls, and certainly the hot air balloon. I can especially recommend starting with the Lower Gardens. Old Harry Rocks – is a fantastic spot for people who love a good walk, kayaking, and terrific sea views. The unique chalk cliffs look very gorgeous contrasted with the black cormorants and the blue sea. It’s God’s gift especially after miles of walking. Bournemouth Aviation Museum – nearly every boy and girl dreams of entering a cockpit of the real aeroplane. This museum allows you this and much more. You can even climb all over the yellow rescue helicopter and take a selfie in the bomb aimer’s seat. It’s the right place to explore aviation history.